Great food (best hoagies in Avalon). Waterfront dining. Fishing. Boating. This is why you come to the Jersey Shore. At Moran’s Dockside in beautiful Avalon, NJ, you can have one of the best made-to-order hoagies in town and enjoy your sandwich or hoagie with a stunning waterfront view. 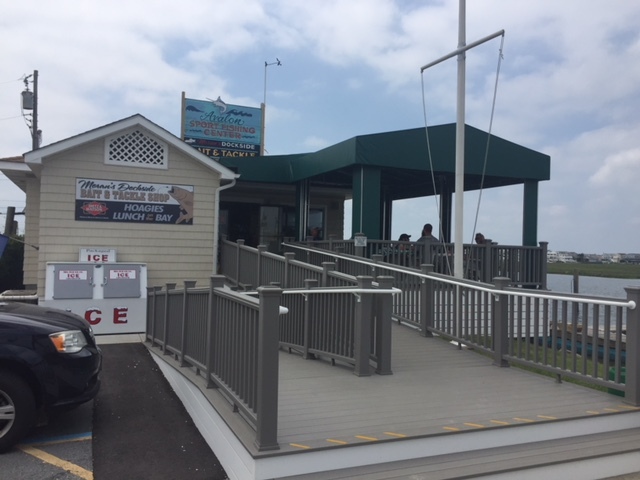 Moran’s is located at the north end of the island, in the Avalon Fishing Center. At Moran’s, all of our hoagies and deli salads are made to order every day, with only the best ingredients…Dietz & Watson meats and garden-fresh lettuce, tomato and onions. Sit comfortably on our covered dockside deck and dine here with the pleasant view of Cedar Island. Or toss your sandwich in a cooler for a day of fishing…after picking up all of the bait and tackle equipment you need from our shop. Want to try kayaking along the bay? We offer kayak rentals on an hourly basis too, for a relaxing Avalon outing. When you’re hungry for a great sandwich at the shore, visit our shop for breakfast or lunch, and meet Jim and, on occasion, Helene…the folks that have been making fresh hoagies for residents and visitors of Avalon since 1988. You’ll love the food, the view, and the equipment for an enjoyable afternoon at the shore. Call ahead and your order will be ready when you arrive!